Health and safety is one of the most important aspects of an organization’s smooth and effective functioning. Good health and safety performance ensures an accident free industrial envronment.With continuous effort of various legislative bodies and NGOs the awareness of OH&S has improved in India considerably. This demands adoption of a structured approach for the identification of hazards, their evaluation and control of risks. 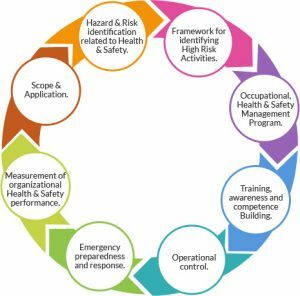 This intends to assist an organization to develop a systematic approach to management of OH & S in such a way as to protect their employees and others whose health and safety may be affected by the organization’s activities. The OH & S management system can be very well integrated with management of other aspects of the organization. Basic principles of OH & S management system.